Vienna’s Museum Quarter is fabulous, but it constitutes only a very small part of the city center. This travelogue will attempt to do justice to the rest of it. A tall order, believe me. If one were to subdivide the downtown, it would probably be like this — the City Ring is a semi-circular arc of major road that surrounds the Museum Quarter and the business district and connects with the Danube at both ends. The business district is the high-end touristic shopping area, while outside the City Ring is the day-to-day shopping area. The Ring itself is where the major of Austrian national and Vienna city buildings reside, the most recognizable of which is the Vienna City Hall, shown in the first photograph above. Located not far from the Museum Quarter, it is just as fabulous (and as you can see, just about as massive). The hall has a massive courtyard that hosts an outdoor cafe in the summertime and there are numerous monuments and small parks hidden among the trees. What an incredible sight it was. Across the street from the town hall was the Burgtheater and Volksgarten, the latter shown in the second photograph above with the City Hall visible in the background. The Volksgarten was sheer delight with all the red roses and sculpted hedges underneath a perfectly blue skied May morning. The mini-Parthenon stood in the center, hosting a small art exhibit when I was there. Facing it was a stone monument that contained reliefs of various battles (I did not take note of which battles were represented). The other government buildings along the City Ring had a lot in common — they were huge, bright white with gold trim, and at the time most were undergoing reconstruction. 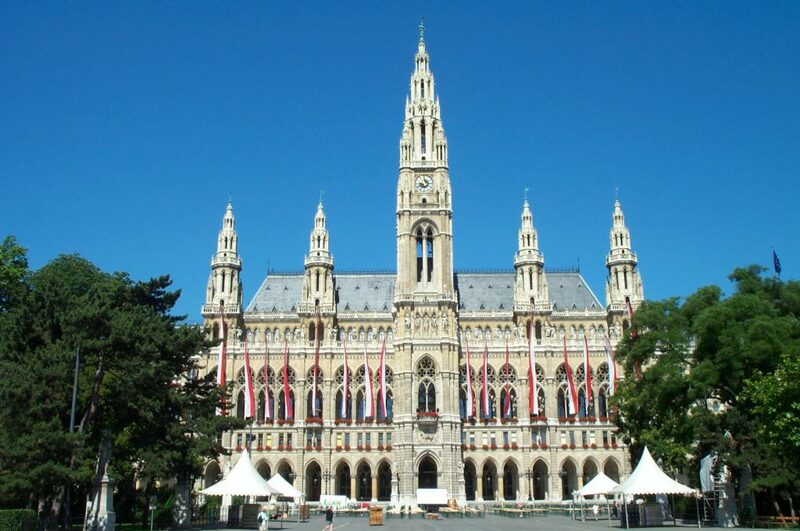 Between the City Hall and the Museum Quarter was the Austrian Parliament building. This was a colonnaded structure with lots of steps and a massive warrior statue on a white column near the sidewalk. It was from here that I went back through the Museum Quarter and Royal Palace toward the city center. My path took me out the rear of the palace to Michaelerplatz. This plaza was fabulous not only because of the gorgeous white fountain there but also because nearby was an archaeological dig. I could not tell how old the ruins were, but they were comparable to 1st century Roman ruins found along the Rhein River in Germany. From Michaelerplatz, I proceeded down to a district called the Kohlmarkt further to the center of the downtown. Along the way, I stopped in St. Michael’s Church, a small church in the middle of the street with a fantastically well-preserved medieval-era chapel (or, it was one heck of a reconstruction). 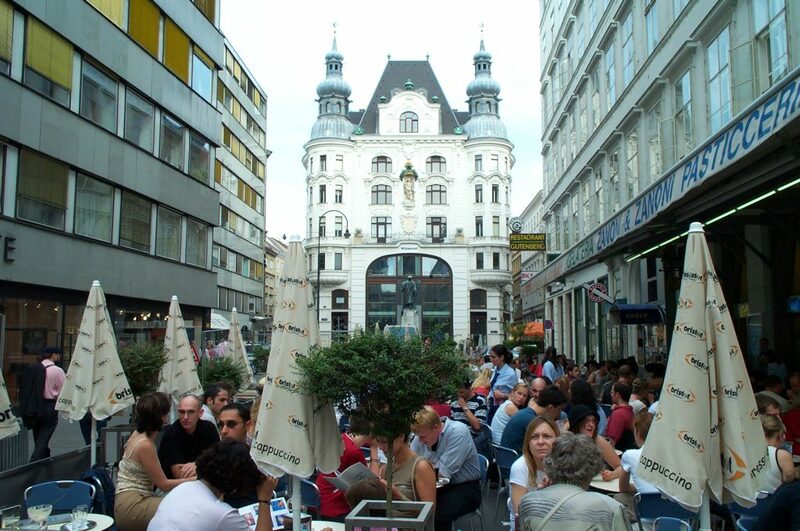 From the Kohlmarkt, I turned right onto the Graben — Vienna’s main tourist shopping district. The Graben is a massive pedestrian boulevard about a half-mile long bounded by some fantastic structures — shops, hotels, restaurants, etc. 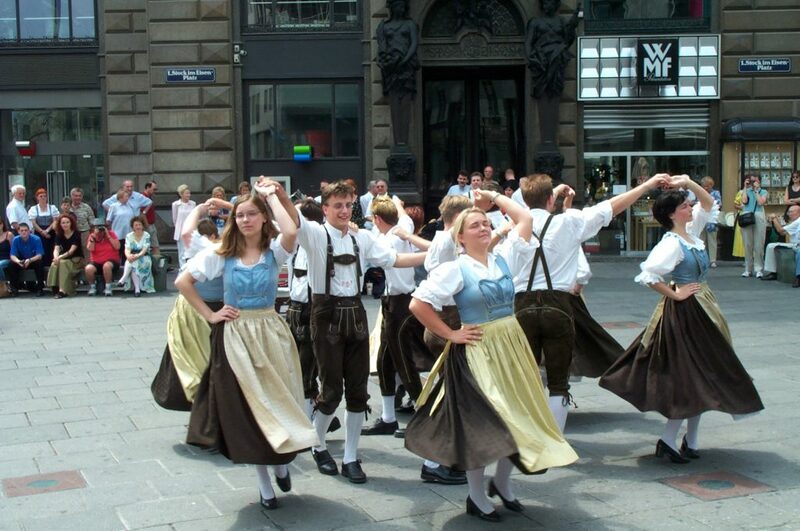 The Graben was completely crowded by lunchtime, and I was pleasantly surprised by the display of traditional music and dancing that delighted everyone. One shot of this is shown in the third photograph above. The largest and most impressive structure in this part of town was Vienna’s main Cathedral — the Stephansdom. 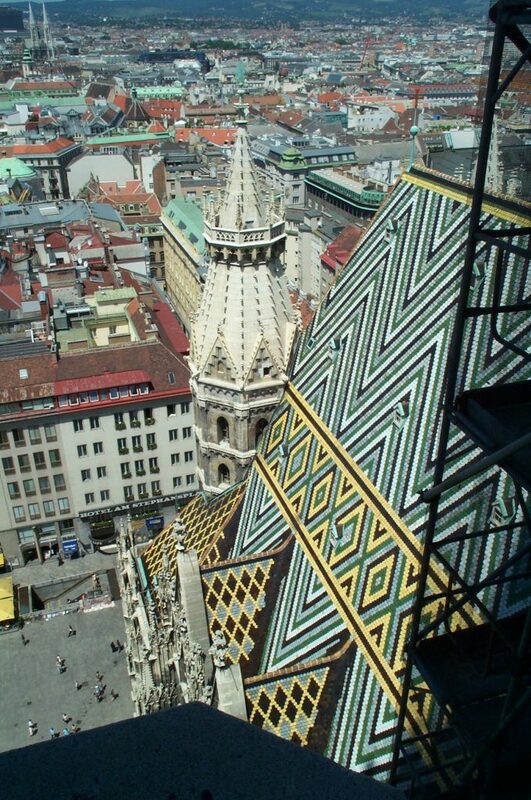 It was remarkable because of its colorful roof, showing patterns of white, gold, green, and black tile such as presented in the fourth photo, taken from the spire. On the opposite side of the roof, the tiles are patterns into a massive Art-Deco eagle — the symbol of Vienna — with the year of construction (1831) spelled out in tile. Not only is the spire available for climbing, for a small fee, but you can also enter the crypt, which supposedly exhibits urns containing the embalmed innards of the Habsburg kings and princes. Those interested in ecclesiastic art will find the Stephansdom’s tabernacle very impressive. The climb to the top was hidden away and one of the more claustrophobic that I’ve done, but the view was fantastic. I proceeded further in the general direction of the Danube, then to the southeast back to the Ring. Along the way, I encountered a small restaurant square known as the Lupeck, shown in the fifth photograph where I had my own lunch. I do not know the significance of the gorgeous structure in the background, but as you can see, the cafes and restaurants were filled with people and various cuisines were available. I continued a couple blocks further down and found the crowd thinning a bit, but before turning southeast I found a red brick Greek Orthodox Church that was worth checking out. Its interior was absolutely regal with gorgeous murals, red marble, and golden trim. Once I got back to the Ring, I came upon the Stadtpark (“City Park”). 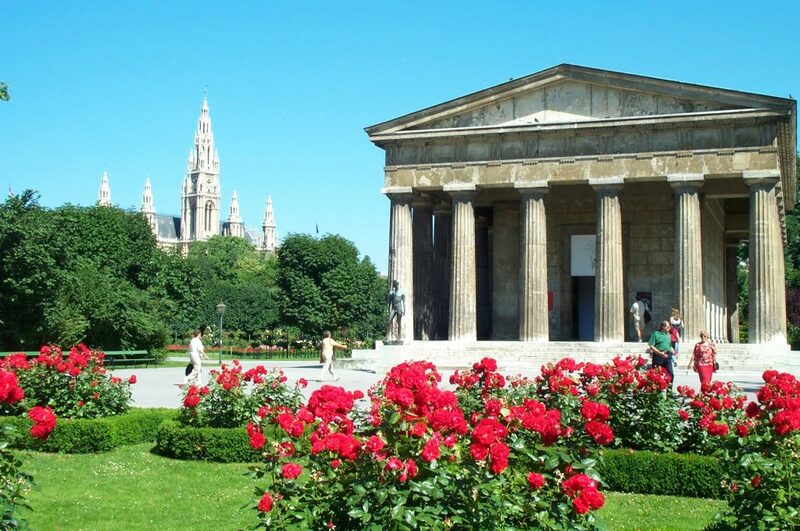 Like the Volksgarten, it had plenty of red roses and other flowers, monuments, and other attractions along the way. A particularly impressive monument was a huge stone wreath standing upright with a gilded violinist mounted on the inside and surrounded with colorful flowers. At the western end of the park was the Kursalon, shown in the sixth photograph. This was a small concert house and flower garden with several statues and monuments of Vienna’s many famous composers and personalities. A gazebo, visible just behind the flower clock, houses string quartet performances in the summertime. Further west was a huge Beethoven monument followed by the gorgeous Wiener Konzert Haus. Adjacent to this was a music school, and I recalled hearing young students hard at work with the strings. At the corner of the Ring was the Schwarzenburgplatz and its massive World War II monument. What was most interesting about this monument was the fact that it commemorated the Russians who helped liberate the city from Nazi Germany. It was easy to forget that despite Austria’s alliance in the European Union, it was fully neutral during the Cold War because it maintained ties with Russia. Next, at the point where the Ring turned back north to the Museum Quarter, was the usually-shaped Karlskirche (included in the Photo Gallery). The Karlskirche has a large pool in front of it, and several bands of street musicians were there competing for donations. I recalled the competition being fierce as one musician did a horrible rendition of some pop song only to have the others overhear and belt out better versions. The final major structure was the Schillerplatz and the Opera House. Vienna’s city center is chock full of things to see and do, so don’t be too enamored with the Museum Quarter (which is a difficult thing to do), make sure you leave yourself a couple hours so you can walk around and see the whole city!